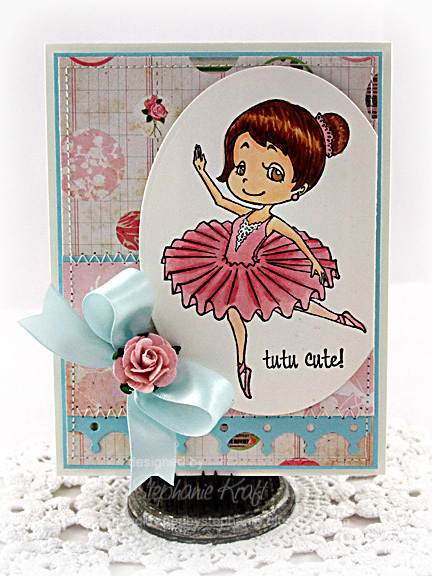 HandKrafted by Stephanie: SCRSC79: tutu cute! Hello! 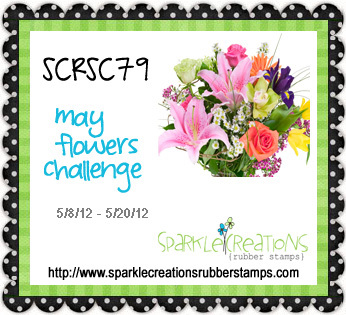 Welcome to week 2 of the current Sparkle Creations Rubber Stamps Challenge (SCRSC79)! The challenge is May Flowers! You have until Sunday, 5/20/12 @ 9 PM PST to play along. All of the challenge details are HERE. I finally had a chance to ink up Ballerina Ruby (who was released last month)! While coloring her up this weekend, Sabrina came in and got excited to see a ballerina and immediately made her usual comment, "that's ME!"... LOL! Accessories: Petite Oval Nestabilities (Spellbinders), Die-namics Crown Border (My Favorite Things), Markers (Copic), Satin ribbon, Rose (Wild Orchid Crafts), Foam tape, Thread, Sewing machine. I loved seeing her birthday pics, that cake is too cute! Her hair looks so pretty curled! I hope y'all had a fun day! This is so pretty!! What a wonderful card!